Concession Machine Rentals | InflateDallas.com Euless TX. Now you can serve up tasty treats just like at the circus, when you rent our easy to use concession machines. Concession machines include limited supplies where indicated with extra supplies available at an additional cost. 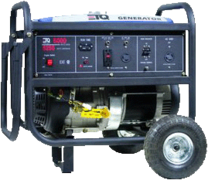 If you are having your celebration at one of our beautiful parks, you will be required to provide your own electrical power source, and our generator rental are the perfect solution. Browse the selections below and click on the image or "more Info" link to get additional details and to make a reservation.